Something completely different was the intended post topic for the Everyday in May challenge today. I may have missed the mark on the suggested intent- but I think I’m dead on in a literal sense. What’s more completely different than a lizard in over watch? This little guy was observing my fly angling operations the other day on Red Bud Isle. There is a fair amount of concrete in the area near the base of the bridge with sparse random bushes and sapling trees. I don’t know what drew my attention to him other than my grunt sense of being watched. But not the spied on kind of watched. But like I have you back kind of being watched. Paratrooper over watch are the guys covering you while you move. You know- like in the movies. Well I felt he had my back and it was a good day fishing. Today’s topic of Over Watch Lizard is a modified prompt of the Everyday in May challenge. For more info click here. For all AirborneAngler Everyday in May posts click here. 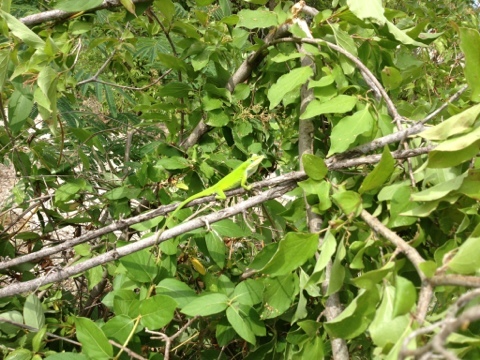 Looks like you found a Green Anole, or maybe he found you? Maybe it was a predesignated rally point. Who knew! ?